I hate packing for a trip. I used to put it off until the very last minute, when I would just frantically throw stuff into my suitcase. I also used to forget essentials all the time and often wouldn’t realize my mistake until the moment I needed the item. Once, I forgot to pack a hairbrush and had to go to a 24-hour Walgreens in Times Square at midnight with dripping wet hair. It was not my finest hour. In the days leading up to a trip, I would scribble down random stuff on whatever piece of paper was nearby when I remembered something I wanted to pack, but this approach was obviously flawed. 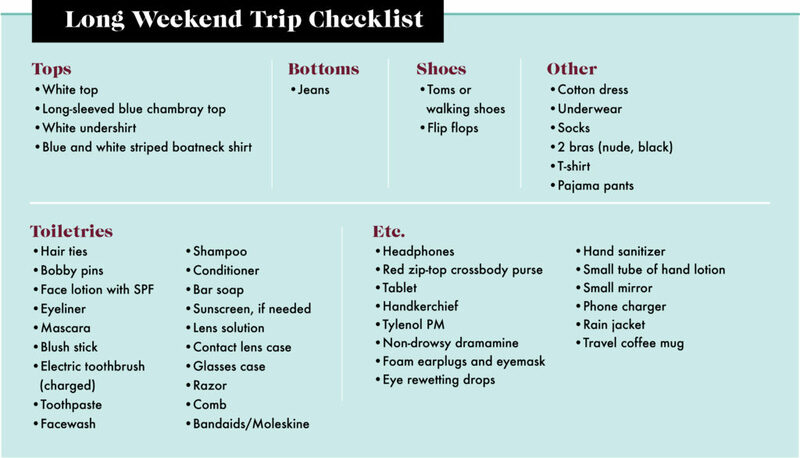 Finally, I channeled my love of spreadsheets and came up with packing lists for the kinds of trips I take most often: a three-day work trip, a two-week long trip to a foreign country, and a domestic long weekend getaway. These lists are all designed with air travel in mind, because that’s what I do most, but they can obviously be tweaked for a road trip as well. I also haven’t voluntarily checked my luggage since 2012, both because most airlines now charge for this service and because I was having extraordinarily bad luck with lost luggage and finally got fed up. 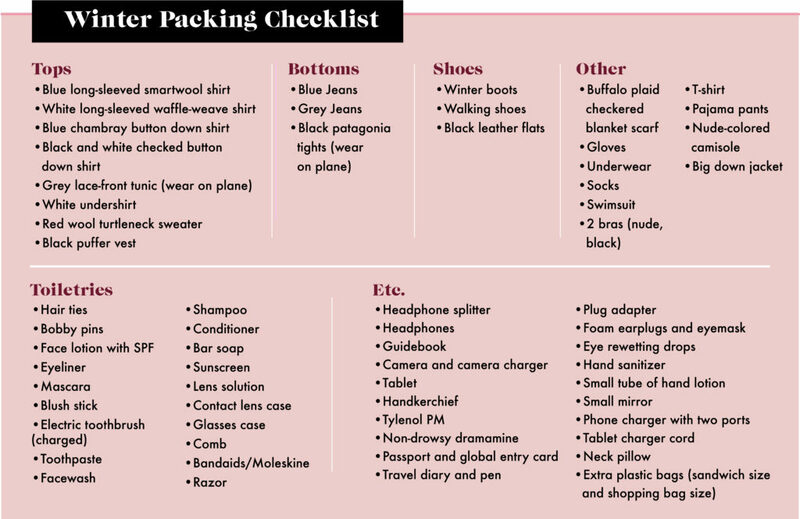 So, the items on these lists all fit into carryon-size luggage and a personal item, which for me is usually a cross body purse. For a work trip especially, black is my friend. I wear the same black pants and suit jacket the entire time, just switching out my tops, and I make sure I have a Shout wipe (or three) with me in case of spills. I pack very light, but include my work tablet, my padfolio for taking notes, and lots of pens and business cards. I like to have my travel mug with me because I tend to drink a LOT of coffee on work trips, and I want to reuse my mug instead of burning through dozens of throwaway cups. I always bring a pair of flip-flops because I don’t like walking on hotel room floors barefoot, and it’s always nice to have a pair to throw on for commuting to and from meetings, especially if I’m walking or taking public transit. My hair is shoulder length and straight, so I can just rely on letting it air dry or using the hotel-provided dryer in a time crunch. For the past few years, my husband and I have taken a two-week trip over Christmas, which is when we have the most time off from work. We usually go somewhere cold, like Europe, when visiting in the winter is more budget-friendly than going during peak tourist season when the weather is milder. I always pack very light and do laundry halfway through the trip, either by sending it out or doing it myself if we’re staying at a place that has a washing machine. Other than that, the only things that don’t get worn twice before I wash them are underwear and socks, and all of my clothes go with each other so I can mix and match to make multiple outfits. I take one “fancy” outfit for a nice dinner or if we go to a concert or party, but it also doubles as the outfit I wear on the plane both ways, because it’s just a dress and black leggings. There are also a few things that are essentials for me for a longer trip. I like to bring my fancy DSLR camera, the charger, and an extra SD card to ensure I can take all the pictures I want. I bring a small travel diary and my favorite kind of pen so I can record all the things we do and the yummy stuff we eat and drink. I make sure to pack essentials for traveling abroad, like a plug converter, my passport and global entry card, a guidebook for the destination, and my travel neck pillow so I can try to get some sleep on the overnight flight. These are all items I don’t take on a shorter domestic getaway. I also always wear my biggest items on the plane, including my puffy down coat, which doubles as a blanket if the plane is chilly and gets stuffed in the overhead compartment if it’s not, and my bulky winter boots, which I just slip off once I’m at my seat. Finally, I take at least a half-dozen plastic shopping bags. 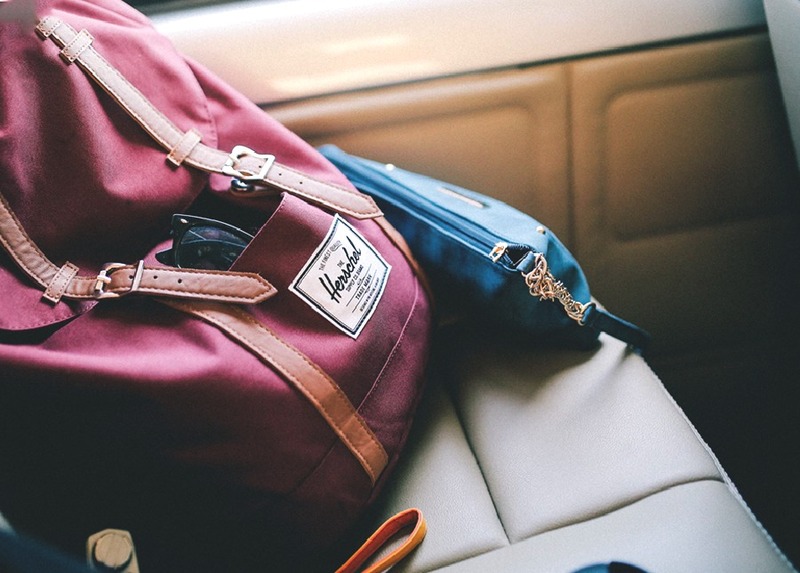 Especially on a longer trip, you will always find a need for extra plastic bags to corral dirty laundry, wrap up exploding shampoo bottles, or to separate out dirty shoes from clean clothing when it’s all in the same luggage. This is the list that’s the most variable, depending on where I’m going and what I’m doing there. If I’m on a quick getaway with my husband, I’m probably going to just wear the same jeans all weekend, but I often throw in a dress in case we go somewhere nice or if the weather’s warmer than expected. If I’m visiting my parents, I don’t need to take all my toiletries or pajamas because I keep a set of that stuff at their house. If I’m flying to see my sister, I pack a hiking outfit because she lives in the mountains and we almost always get outside for a day. Other than that, I have a few outfits that I know travel well and I usually rely on some form of those, like a white eyelet top in the summertime or an off-white knit sweater in fall or winter. If it’s summer, I swap in my favorite jean shorts and I sometimes leave the raincoat at home. But for the most part, I wear the same things when I travel because I know they fit, are comfortable, and look cute together. This approach might not work for everyone, especially if you like to have lots of outfit options or want to bring more pairs of shoes. You won’t get any judgment here — some people might thinking of bringing along a bulky camera is a waste of space, but for me, it’s a must. 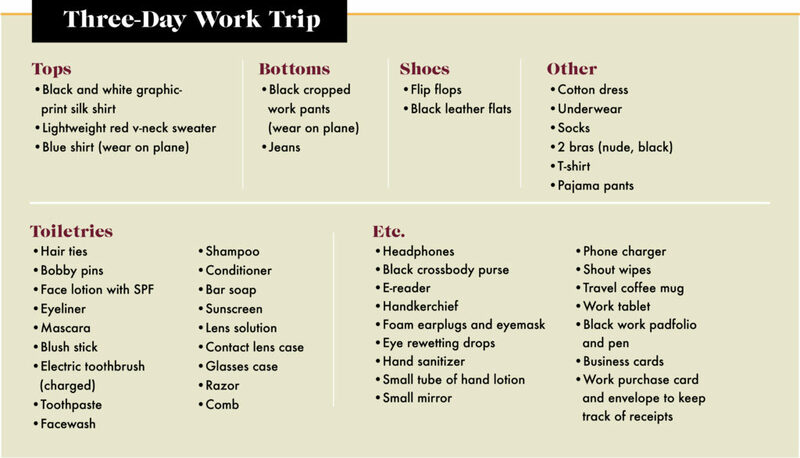 By using spreadsheets when I’m pulling out my suitcase to get ready for another trip, I can pack in 15 minutes and don’t dread the task anymore. I can also rest assured that I’m not forgetting anything essential and can focus on the fun parts of a trip, like planning the perfect itinerary — yet another task I complete using my love of spreadsheets.